The band, best known for the track I Believe In A Thing Called Love, got back together in 2011, five years after splitting up. 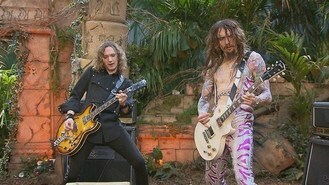 Now The Darkness, who will be supporting Lady Gaga on the European leg of her tour, are performing on the CBeebies show, which features a band of primate friends who play music in their tropical island paradise. The catsuit-wearing band had a No 1 with their first album, Permission To Land. They won three Brit awards in 2004, including Best British Album, and had five top 10 hits but split in 2006 when singer Justin Hawkins quit. The frontman later revealed he had fought a secret battle with drug addiction and alcoholism. Last year it was announced that all four original members of the Suffolk band had reunited. Guitarist Dan Hawkins said of the ZingZillas appearance: "There have been many legendary musicians on ZingZillas in the past so we were honoured to be invited to the island to perform! "Since becoming a dad twice in the last two years I have often found my sanity being saved after sleepless nights by watching ZingZillas, with their great songs/musicians and often funny storylines." The episode is broadcast on Monday April 23.